I've read about them, witnessed them but until yesterday... I have never experienced it first-hand. Until yesterday. You see, I have a really good baby. I know what you're thinking. Everyone thinks they have a good baby. But I really do. I get told that ALL the time. 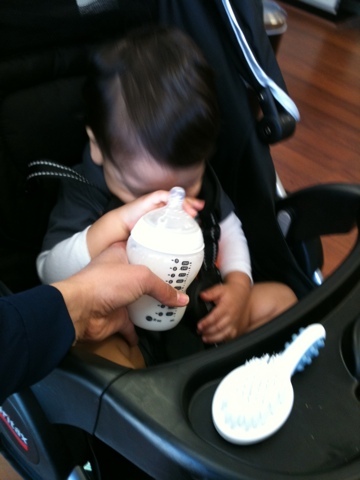 We are one of the lucky few who gets to go out to restaurants often and never have to worry about Cruze getting fussy, whiny, etc. He's just really chill. So I do everything with him. Shopping, cleanings at the dentist office, haircuts... Until YESTERDAY. You see, I've been in desperate need of a haircut. I'm trying to grow it out for my brothers wedding in May but the shape has been making me feel like I'm 20 years older than I am and not cute AT ALL. So I made an appointment and like always, brought the little with me. I mean, what else would I do with him? 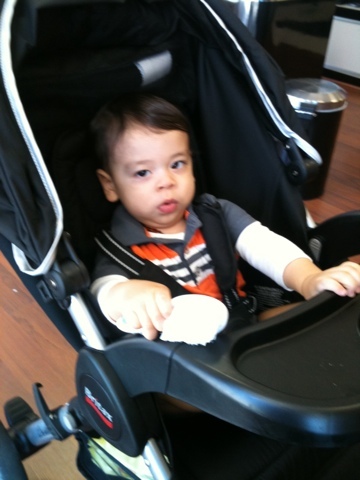 My stroller has been a lifesaver for our family. When he's in that thing, he sits quietly and plays with whatever toy he has. This can last for a few hours - no lie. Ohhhh but not yesterday. The hairdresser was not a friend of mine, I've never been to her before. She happens to be a friend of a friend of a friend.... So I don't know her. Just liked her work and viola. There I was. First impression Eliza. Anyhoo, I walk in and wait an extra ten minutes or so while she finishes someone up. Cruze is his usual self. Playing with his toy and book. 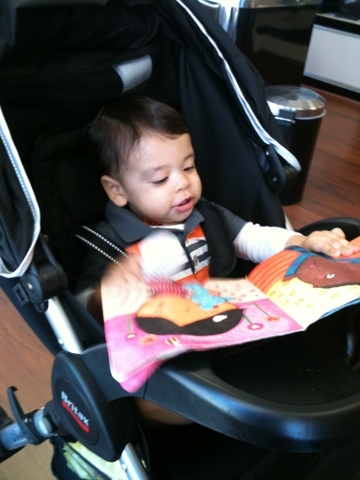 Laughing as he turns the pages and so very well behaved. When she finally calls me over to her chair and we get settled in our spots, it all starts. It was as if a switch turned on in my little "angel". He starts yelling. YELLING. The salon was quiet and full of older women who clearly liked it that way - QUIET. Enter Cruze. I was mortified. I thought it would end but it didn't. It just got worst. AND LOUDER. And more angry? It sure sounded that way. I would have her hold on so I could hand him a toy only to watch him THROW it with force across the floor just 5 seconds later. He would stop for a second or two only to restart with more energy. More kicking, more yelling, more throwing. It was too late for me to just leave. I had to stick it out as best as I could. I kept apologizing, I'm pretty sure I was sweating from the humiliation and annoyance we were causing. I left in such a hurry, she didn't even get to finish styling me and I didn't know what it looked like until I got home. And I'm kinda ashamed to admit, I left in tears. It was one of the most stressful situations I've been in with Cruze. I should probably toughen up because with his terrible twos creaping closer and closer, I think we might have something coming for us. he's giving me evil eyes! I should have known to run out the door the second I saw this! 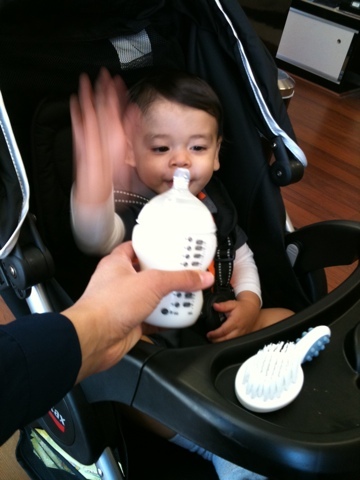 "get that bottle OUT OF MY FACE!" OH mama you had a bad day!!! Sorry you felt so embarrassed but those old ladies probably had similar days when they were younger. Oh my lol love the pics. Does it make you feel any better to know that this will happen every single time I take Damian anywhere unless he's being worn? 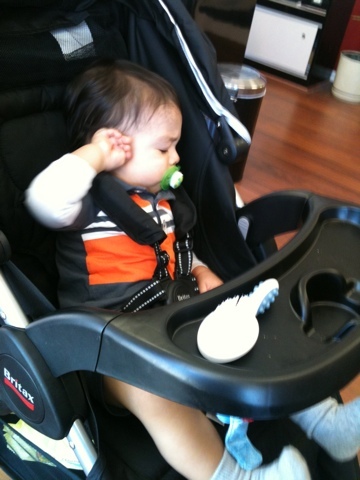 I have a forward-facing stroller now but if he didn't have 100% of my attention, it's over. When you said you were bringing him to the salon - I had to double read! In any case, he's still a really good baby and you're a really good mom, everyone's entitled to a bad day! I've been browsing online more than three hours today, yet I never found any interesting article like yours. It is pretty worth enough for me. Personally, if all webmasters and bloggers made good content as you did, the web will be a lot more useful than ever before. Geez...I'm still nervous about even lunch outings. Dinner with our little one are out after her epic meltdown last week. I was driving, borderline dangerously, as fast ad I could to get us home. Do you've any? Kindly let me understand so that I may just subscribe. Thanks.